Our brochure for 2019 was sent to everyone on Honeyguide's mailing list early in late August 2018. The programme for 2019 is on this website, and summarised below. If you are not on the mailing list and would like a brochure for 2019, please contact us. In the column on the right you can also view a PDF of the brochure for 2019. For booking information, click here. Las Tablas de Damiel National Park, La Mancha. Below you can see our holiday calendar in one place, check availability and click through to our holiday pages. For prices, look under the 'holiday details' for each holiday. Last updated 22 April 2019. Dordogne 19-26 September an additional holiday in the programme. We are open for bookings. Crown daisies, both colour forms, Crete, April 2018. To download a PDF of the Honeyguide Wildlife Holidays brochure for 2019, click on the picture of the cover below. The brochure for 2018 and previous years are here. Additional group holidays can be arranged. Destinations from previous years we keep on the website in the archive section. They may be available for group bookings and others may return in a future programme – especially if we receive requests for them. Wildlife holidays in southern Africa, where and when you would like to go. See Your South Africa. For two years, 2009 and 2010, we sent Honeyguide brochures to those on the former Gullivers mailing list. We continue to do so to those who have been in touch and are now on the main Honeyguide mailing list. 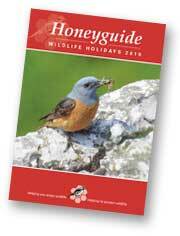 If you were with Gullivers, aren't getting the Honeyguide brochure but would like to, please contact us.